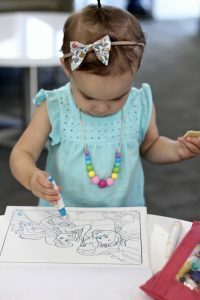 Have you traveled with a toddler yet? I traveled with Izzy when she was 4 months old. I wouldn’t say it was easy, I was still a new mom and flying with a baby. But I still think that is much easier than flying with a toddler. Toddlers want to get down and walk. They need constant distractions & snacks. We recently when to visit Izzy’s Great Grampa Ted. She’s 19 months old. Some would say she has even started the terrible twos with tantrums. I thought we were in for frightening flights, but Izzy was amazing! 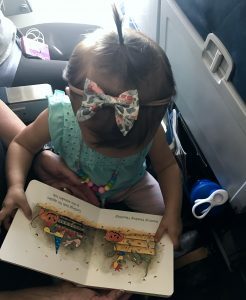 Many people told us how good she was and they had no idea there was a baby on the plane and the man sitting in our row even called her a born traveler. I like to think this was all because I was a well prepared & organized mama! We had connecting flights because the airport we needed to fly into had a shorter drive from the airport to his hometown. So we really got the full experience guys! From driving with her to flying and running to a connecting flight. I’m going to share what worked for us on our trip & let you know exactly why you need it. 😉 If you are traveling soon then I suggest you sit back, sip some wine and start clicking and shopping. I have everything linked for you. 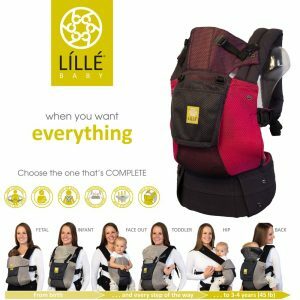 Why do you need a Lillebaby carrier? Well I have say I have owned a few types and brands of baby wearing gear from carriers to slings and this has been the most comfortable and easiest way to carry Isabella when I need to be hands free. 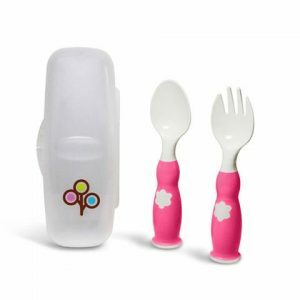 There are times I have needed to use it in the grocery store, while cooking dinner and then of course while traveling. When in the airport you need as many hands as possible! I had a carseat bag on one shoulder, the diaper bag on the other, Izzy on my front and I was rolling a carry on bag. Yes, I looked like a human mule and I needed my arms. At one point we had to run so we didn’t miss our connecting flight and I tell you what the Lillebaby really came in hand then. I chose the toddler Complete Airflow Charcoal with Berry. The complete airflow was great for the airport because you always get hot running around and moving from one side of the airport to the other to catch a plane. At the airport and ready to head to our gate! Why do you need Zoli products? These water bottles I chose were perfect for travel because of their size. 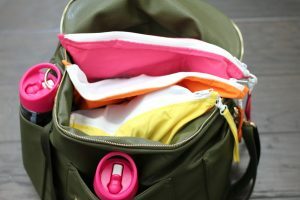 I was able to fit Izzy’s & my water bottle in the diaper bag pockets easy peasy! The snack container was perfect because I could fit all of her crunchy snacks inside and they don’t get smushed during travel. 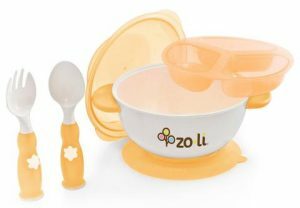 Zoli also makes awesome silverware and bowls that are perfect for on the go. Snacking in the Delta lounge. 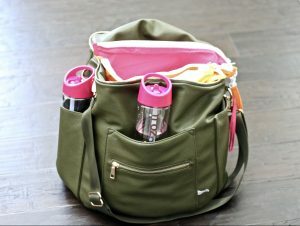 Why do I need a Fawn Design diaper bag? Beyond the fact that this bag is absolutely gorgeous, you need it because the comfort, size and design. This company created a bag that is perfect for travel. You can wear it on your back or on your shoulder. 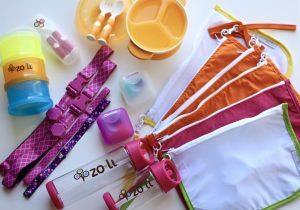 I also think that this bag was made perfectly for the Mother load organizers and Zoli water bottles. 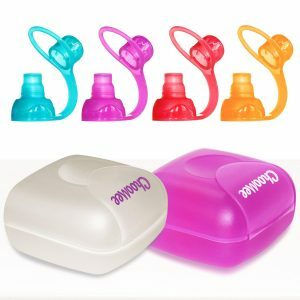 Why do you need ChooMee travel packs? We have always loved these products but the travel case is a must I could easily find the covers and store them back into a case after using. The covers keep pouch contents from being squeezed everywhere and the it’s soft so Izzy can chew on it as well. Izzy enjoyed her travel snacks for sure! Snacking in the Delta Sky Lounge. Why do you need Motherload Bags? 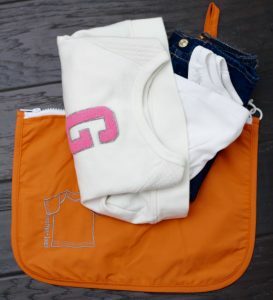 These bags are ideal for organizing a diaper bag or travel bags. I had Izzy’s snacks in one, toys in another, a change of clothes and had the dirty clothes bag folded inside. I also used some to keep items together when packing. Like all of her little socks and headbands were stored neatly and didn’t get lost. 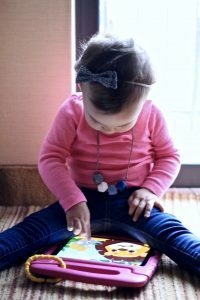 Why do you need a tablet with the Kidloland app? Distractions when traveling.. that’s key! How about educational distractions, um yes please! Kidloland is an awesome app. It’s more like an app with a million apps inside. Okay I’m exaggerating it’s actually an app full of 800+ nursery rhymes, songs, stories, activities and games. We have still yet to play all the games, listen to all the stories or engage in everything it has to offer. Isabella likes the stories. You can chose to have them read to you or for it to allow you to read. There are songs and games as well. Izzy loved the songs about shapes and colors and of course wanted to watch the song about her favorite shape, the star on repeat! Thumbs up from this educator on this app! Listening to an interactive story in the hotel room. Why do you need a Dock A Tot? You all may or may not have seen my post on why we started using the Dock A Tot. Read more here. 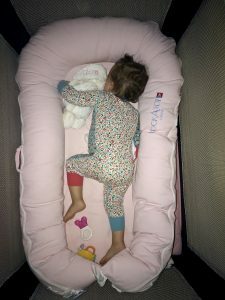 This is a travel must have because it creates a cozy space for your child so weather they are sleeping in the bed with you or in a pack n play you can be certain they will feel more at home. Also I think it’s important to have a spare cover with you at all times. You never know when you need to change your babes cover from drinks, to vomit to umm I’ll let you guess the rest. You are probably thinking, drinks in bed? No, but that brings me to another point. The Dock A Tot is also the perfect lounger when hanging in the hotel room. Izzy slept hard in the hotel with her Dock A Tot. Looks cozy doesn’t she? Why do you need HNY BABY products? Things can get dropped or fall when rushing around an airport. 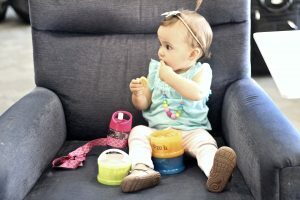 The toy along and sippy strap are must haves. When out to eat I attach Izzy’s cup to the highchair with the sippy strap. If you are taking a stroller you can hook it to that. 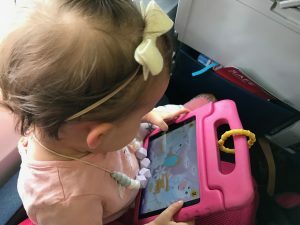 The toy along is great for attaching a toy to your baby carrier or stroller because the last thing you need is a lost “favorite” stuffed animal while traveling. Chilling at the airport in the Delta Sky Lounge. 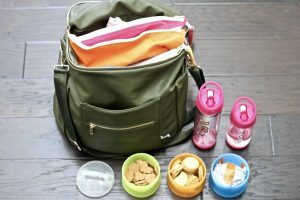 I hope my travel must haves list helped you out and you feel more prepared for the trip you will be taking with your littles. Safe travels! I know you littles are going to enjoy the journey to their destination & what they have waiting for them when they get there. 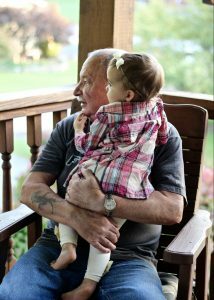 Izzy sure loved meeting her Great Grampa & he loved meeting her too! Great products! I couldn’t agree more with most of them! 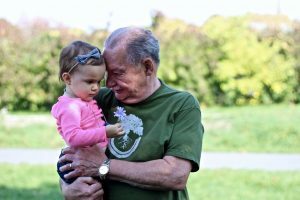 So glad Izzy got to meet her great grandpa and have a wonderful bonding experience! Thanks Jacki!! It was a great experience for both of them ? This is such a great list of products!! Yay Izzy!! That is so awesome, glad to hear she did so well on her flights! I love this! It really does make a difference when you’re organized. We had EVERYTHING go wrong on one of our connections once. We were delayed, so we thought we might have missed it. Then realized it was closing the doors two mins after we landed. And the gate was SO FAR AWAY. So we ran. 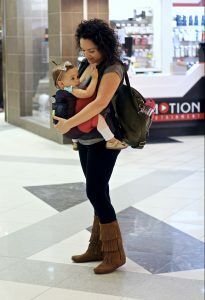 With me wearing Blaire and dragging her diaper bag and my own bag. And Jason carrying his carryon. 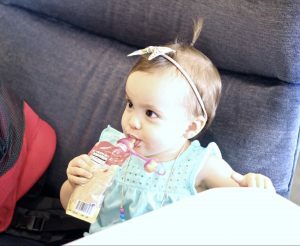 We didn’t have time to stop to change her diaper or put her into her PJs or get her milk… and then our plane had no milk. It was the worst. So we have learned not to plan on being able to accomplish anything at the airport, and to arrive there expecting the worst! This post is so awesome and very much needed for us. 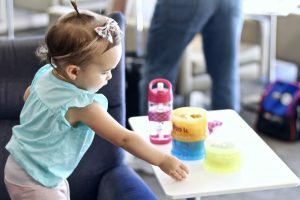 We are traveling with our toddler next month and I have been looking for posts like this. I love the bag that holds her clothes. So awesome! So I basically feel like I need all of this now! So many good items to travel with! You def do! No joke! ? 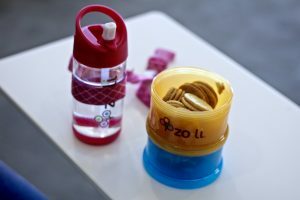 The water bottle is awesome!